I’m back! And I have a delicious new holiday recipe to share with you. It’s like a cookie but better. 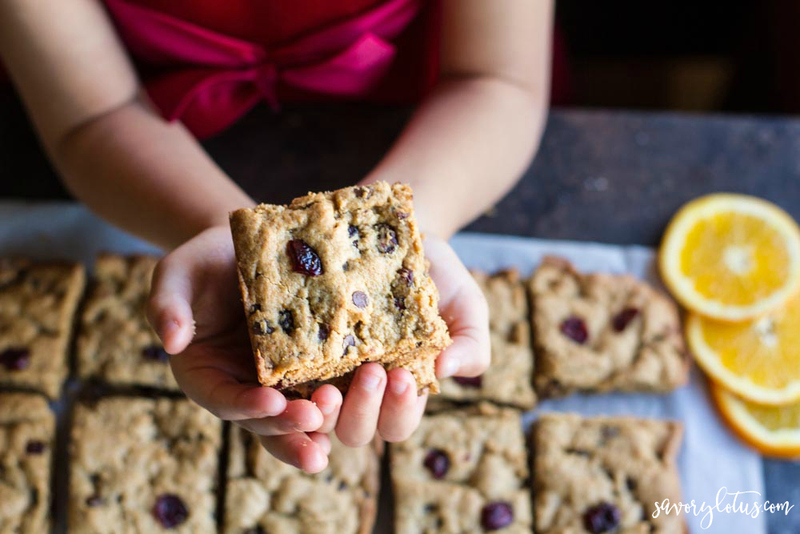 Imaging a zesty orangey cookie bar loaded with chocolate chips and cranberries. Yes, I am finally back. After 6 weeks of no camera, no recipe testing, and no baking, I am back in the Savory Lotus kitchen doing what I love. Stopping by today to share a simple recipe that is PERFECT for homemade holiday gifts and gathering. What’s better than the marriage of orange and chocolate? Not much, in my opinion. And that’s what these little cookie bars are all about. Trust me, I know. I’ve already made several batches as holiday gifts for my neighbors and friends. I can’t tell you how much I love cruising the neighborhood with Little One (all dressed up in her fancy red holiday dress) passing out little holiday gifts. It’s next level adorable. OK, you may be asking yourself what a cookie bar is. It’s just like making cookies but easier. Instead of wrestling the sticky batter off of the spoon each time to get a perfectly round shape, you simple dump the batter in the pan, smooth, and bake. Then slice and serve. You can decide what size and shape to cut your little holiday treats. Here’s the low down on these cookie bars: crispy on the outside and chewy on the inside. 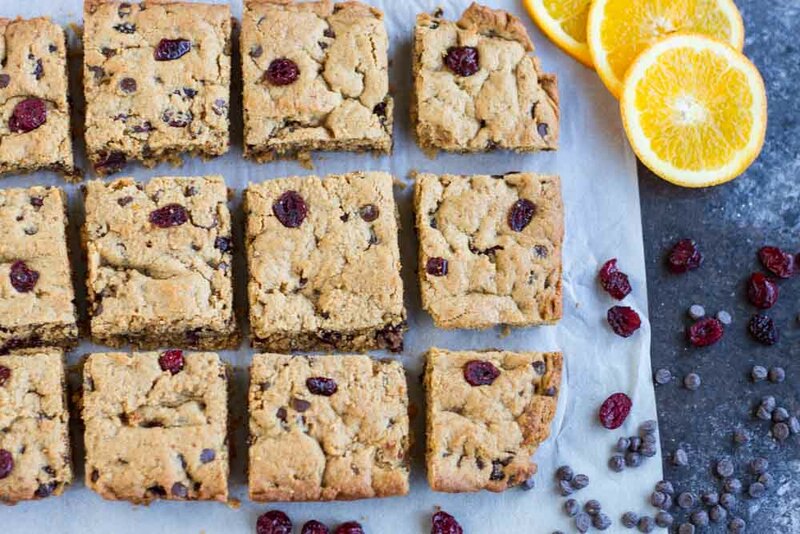 The perfect union of orange and chocolate with dried cranberries scattered about. All gluten free and grain free. I used grass fed butter, buy I bet they would turn out fabulous with coconut oil as well. Wishing you are yours and healthy and happy holiday season. I am so grateful for all of your support this past year. I look forward to more fun recipes in the coming year. Preheat oven to 350’F and line a 9×13 baking pan with parchment paper. Set aside. 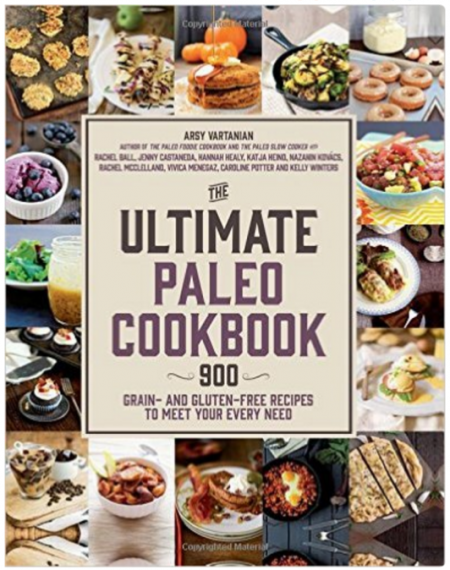 Combine almond flour, arrowroot, salt, baking powder, and cinnamon in a medium bowl. Set aside. In a large bowl, use a hand mixer to beat together butter/ghee and coconut sugar until smooth. Add eggs, vanilla, and orange zest. Mix until well incorporated. Add dry ingredients and mix again until smooth. Fold in dried cranberries and chocolate chips. Using a spatula, evenly spread mixture into prepared pan. Bake 22-25 minutes, until golden. Remove from oven and allow to cool for 10 minutes before lifting edges of parchment paper to transfer cookie bars to cooling rack. Slice into desired sized bars while still slightly warm. These bars are beautiful! 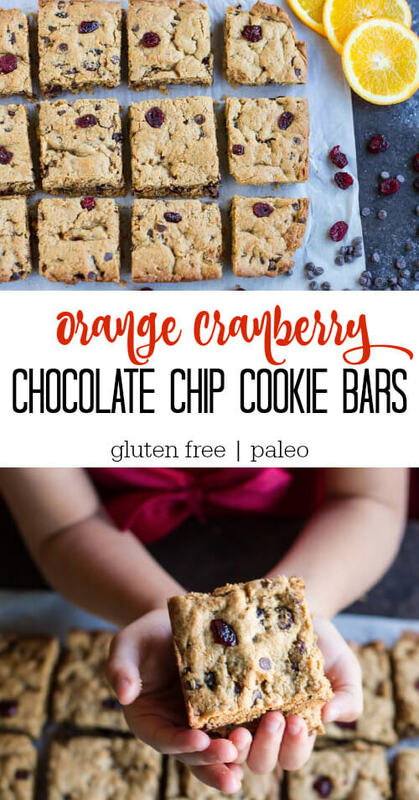 LOVE the cranberry orange combo with the chocolate. So festive and delicious! My family would love these. 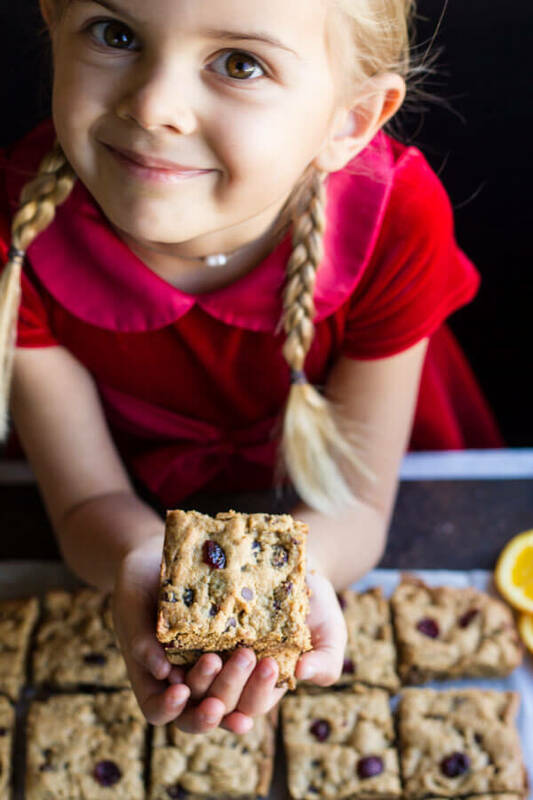 I LOVE the texture of a cookie bar – like you described the chewy and soft! Love it! My girls would flip if I made these – what a great idea! I hope you love them as much as we do. My girls are begging me to make more. Little One wants to make them for Santa! Oh I just love orange and cranberry together!! These look incredible and your daughter is so precious!!! Welcome back, friend! Thanks, Halle! Happy holidays to you and your fam! These chocolate chip cookie bars look so moist, soft, and delicious !! I can’t wait to try them. Thanks for sharing ! Hope you love them! Happy holidays! Hi, Rachel! Yes, she beams pure love and joy! Happy holidays! Ohh!! 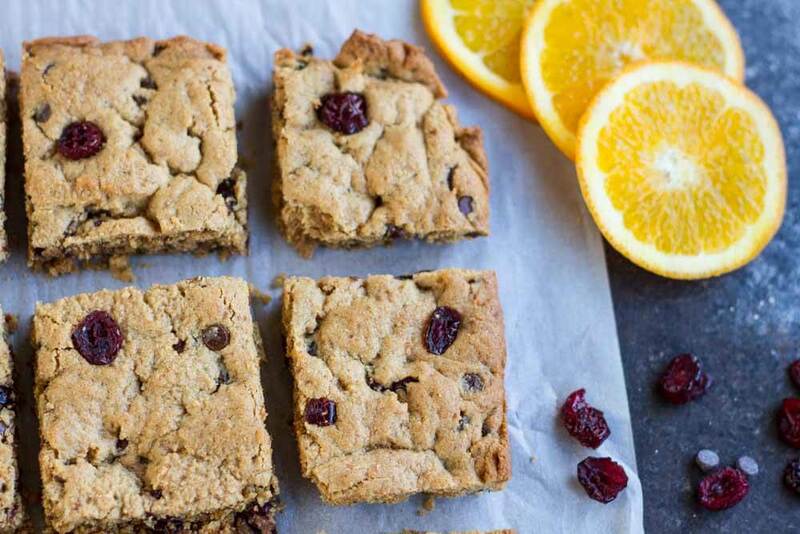 I just posted a recipe with cranberry + orange too, love the combo! But I didn’t think to add chocolate – genius! Also your little one is so cute!! Hi, Kari! We love her, too. She’s our little precious angel! Sweetest child you will ever meet. Happy holidays to you! 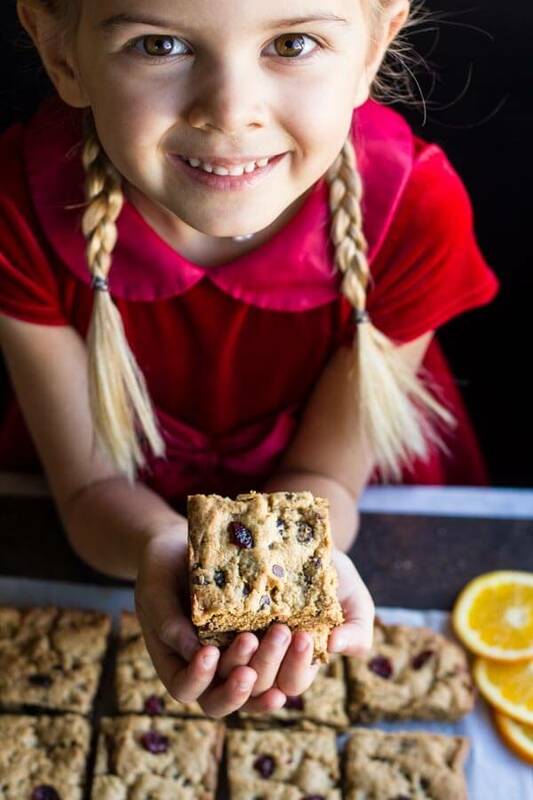 How can I pass this recipe up when there is an adorable little lady showcasing them!? 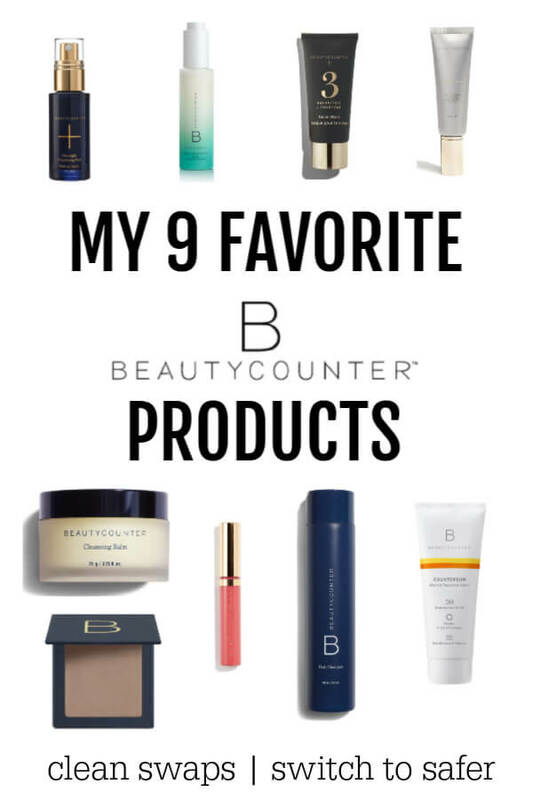 And I agree, orange and cranberry is a favorite flavor combo of mine too! Can’t wait to make these! They look delicious! And how cute is your little model?!! Awe! Thanks, Annie! Sending love to you all! Thanks, Kelly! Happy holidays to you and your family too! 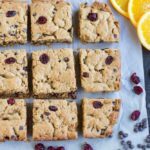 Chocolate and orange are one of my favorite flavor pairings, and cranberry can only make it better! Your assistant is just adorable. Happy holidays!! Thanks, Becky! Happy holidays to you too! Remind me to look at these cookie posts BEFORE i start my baking and not when I think I’m done, because I think I have to go back in the kitchen now and make these. OMG they sound so good! HA! The holiday baking is endless around here. I went a little overboard this year! Enjoy! Wow! I might not have an adorable daughter like you to help me showcase these bars but I know I must make them soon. Thanks so much for sharing these lovely gems with the world! HA! Thank you, Carrie. That is so sweet. I do love having my Little One working with me. Thanks for your kind words! HI, Joey! Why can you not use the 9×13 pan? It’s what I use to make this recipe. It just does not fit in a 9X13″ pan – much too thin. I use a 7×11″ and it works fine. I’m glad it worked out for you! 🙂 I use a 9×13. I don’t like them to be too thick. What is the replacement of arrowroot powder if I can’t find it to buy? you can sub tapioca flour for the arrowroot. Hope that helps.